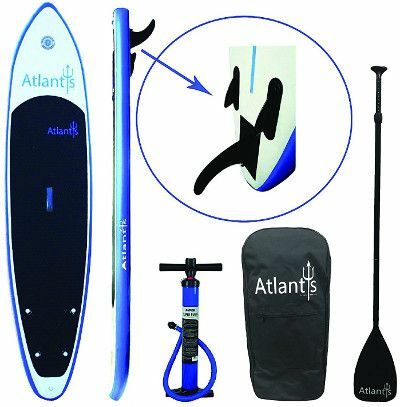 Atlantis is one of the upcoming brands in the industry of inflatable paddle boards but unlike most upcoming brands, it’s actually pretty promising. Indeed, this is a new born company which has managed to compel a significant amount of paddlers to try out their new board which turned out to be one of their best inflatable SUPs. 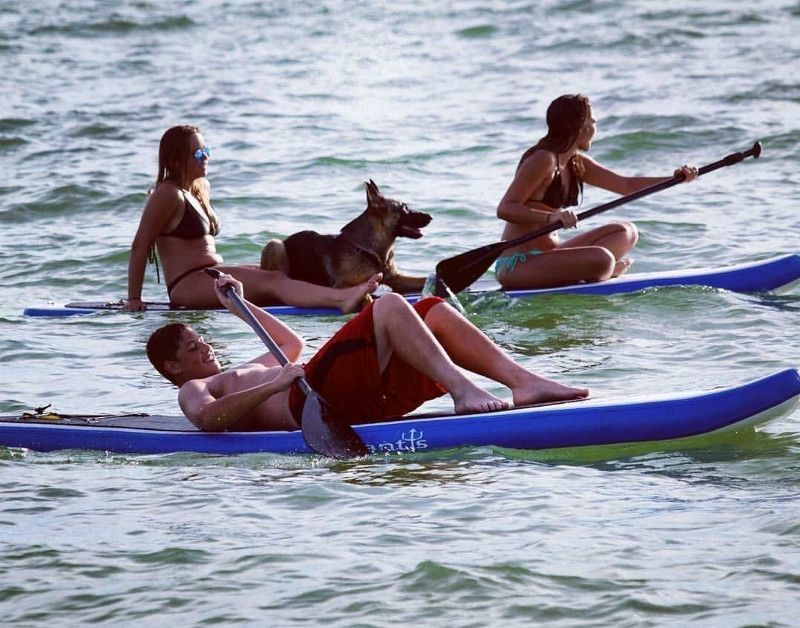 Indeed, the Atlantis iconic paddle board is one which has attracted so much attention lately and it’s one of the most highly rated paddle boards out there. Therefore, we thought that we should break it down and see what the fuss is about. Starting with the most defining aspect of any board, measurement is definitely a big deal here too. In fact, it is this upcoming paragraph which will determine whether you continue reading or start looking for a fresh board. So, buckle up. 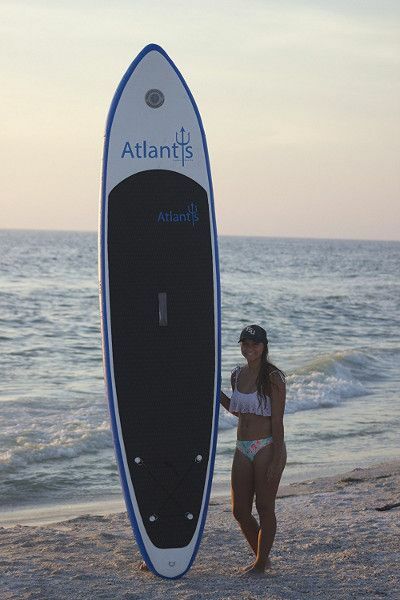 The Atlantis is a large board as it measures an intense 10 feet 6 inches in length, making it one of the best recreational boards on the market. Not to conflict this board with a touring one, the Atlantis is still substantially large but only large enough to cater for adult and young adult paddlers. Hence, if you don’t happen to fall within one of the previous categories then you’re better off with a smaller iSUP. Second, the width of the board is also pretty important as it can impact both the board and the paddler. Accordingly, Atlantis stands at a comfortable 30 inches in width, making it as stable and roomy as you would need, especially if you happen to be a beginner. Indeed, the board’s width will enable you to balance yourself easily by moving around without the risk of falling off. Down to the latest but definitely not least dimension, thickness is in fact as influential as the previous two numbers because it impacts both quality and performance. Hence, the board at hand measures 6 inches in thickness which ranks it up amongst the best stand up paddle boards on the market. Hence, the Atlantis can still take charge of a maximum weight capacity, reaching up to 400 pounds. Ps: Respecting the weight limit is necessary because exceeding the weight limit will make the board bend at the center. Quality has been aforementioned once in the previous passage because thickness does affect sturdiness. However, the board at hand depends on a lot more than thickness to stand where it does today. Accordingly, the Atlantis iSUP is undeniably a tough cookie and that has been reinforced through a thick crust. In fact, the board is made out of the toughest PVC materials which is the same substance often found in zodiac boats and high quality diving gear. Hence, it is designed so as to make it the toughest thing that can still float and that’s a promise given by the brand. Moreover, the board wouldn’t be complete without a little bit extra certainty which is why the brand further enhanced Atlantis via an industrial drop stitch construction, sealing all the seams on the hull perfectly shut and leaving no room for mishaps. In that respect, the board is not a tank but within its range of use, it is certainly virtually indestructible. The best thing about Atlantis iSUP is not the attractive design, which could have been, but the numerous practical little features it comes with. The board is undeniably appealing and that has a lot to do with the fact that it is garnished with a long expanding EVA gripping pad which covers almost the entirety of the board. The gripping pad will hence not only make your experience more stable but it will also enable you to command your board easily while staying on top of it. 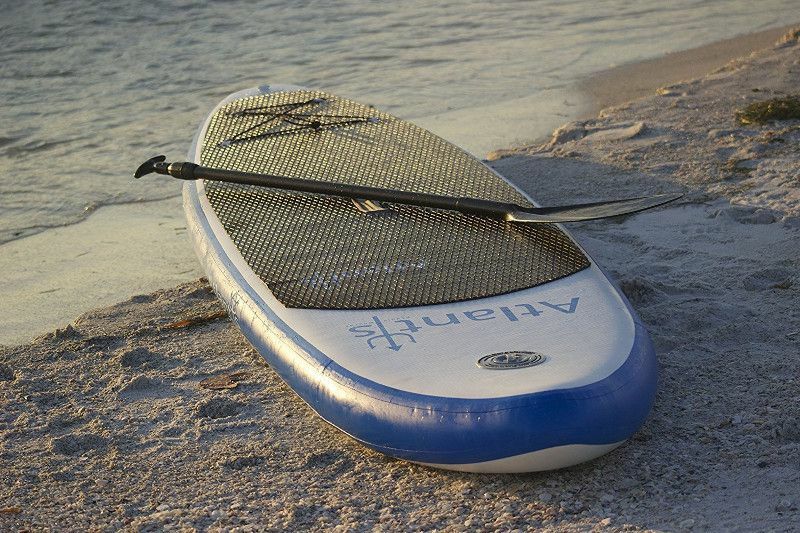 The pad is thus great for paddling but also for Yoga, light workout and meditation. The board also comes with a tie-down system on the tail which consists of 4 D-rings attached with a bungee cord for carrying anything from your camcorder to your shoes. Further, Atlantis features one extra ring by its tail which is meant to for ankle leash attachment. For convenience, this iSUP doesn’t neglect the fact that we need to carry such a large board individually most of the time which is why it comes with a central carry handle. The carry handle will make it simple to carry this board around when inflated without you having to ask for help every time you want to carry it around. Last but definitely not least is the navigation system which deserves a warm embrace because of what it can do for beginning paddlers. Indeed, the company ships their board with a triple fin navigation system which is very responsive and significantly a better tracker than a single fin system. From navigation we jump into the performance of the board at hand and what a convenient passage. Indeed, a lot of the board’s performance depends greatly on the navigation system it adopts which is why this is such a dependable board for beginners. Nonetheless, the board depends on more than just a practical navigation system to function properly. Hence, Atlantis is a solid entry level board with impressive performance skills and that has got a lot to do with the hull design. Indeed, the board is shaped perfectly to cut through water at ease with minimal resistance whereas the nose remains lifting and sharp to cut through the water perfectly and smoothly. The included paddle is ok for beginners. You might want to consider upgrading it. The board is bit heavy and tiring to pump up. You might also want to consider buying an electric pump.